The first ever Global Conference to Strengthen Arbitration and Enforcement in India gets underway in New Delhi tomorrow. 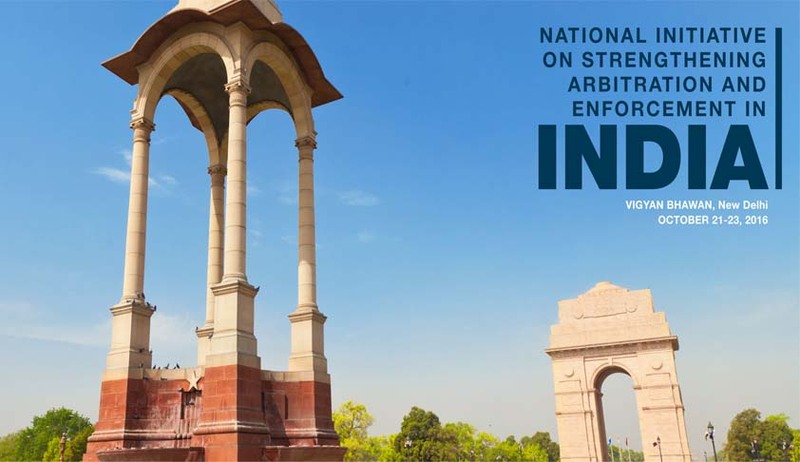 The three daylong conference titled, “National Initiative On Strengthening Arbitration And Enforcement In India” from October 21st to 23rd, 2016 is being launched by the Government and Judiciary as a major initiative to change the face of dispute resolution in India. NITI Aayog, Ministry of Law & Justice, DIPP, National Legal Services Authority, International Center for Alternative Dispute Resolution, National Institute of Labour Economics Research and Development have collaborated to make India the centre of arbitration. Also for the first time six leading international arbitral institutions (HKIAC, ICC, KLRCA, LCIA, PCA and SIAC) and all major industry associations (FICCI, PHD Chamber, CII and ASSOCHAM) have come together to drive this initiative. The Conference seeks to provide impetus to commercial arbitration in India, which is fast gaining pace across the world, for faster, more efficient dispute resolution outside the court room. The President, Shri Pranab Mukherjeea will inaugurate the three-day global Conference on Friday, the 21st October while the Prime Minister Shri Narendra Modi will deliver the valedictory address on 23rd October. The Conference will have the Chief Justice of India, Shri T.S. Thakur as its Patron-in-Chief. Union Minister for Finance and Corporate Affairs, Shri Arun Jaitely and the Union Minister for Law and Justice and Electronics and Information Technology, Shri Ravi Shankar Prasad will also address the conference in addition to luminaries from legal and corporate world. Chief Justices of six countries are participating at the first ever Global Conference on Arbiration in India to share their thoughts. Distinguished Jurist Fali Nariman and William Rowley, QC, Chairman, LCIA Board are amongst the keynote speakers. The best minds from Indian and international legal bodies, corporate houses and the legal fraternity are participating in the Conference. The Conference will serve as a platform for discussing critical issues, sharing experiences on the best international practices and creating a roadmap to strengthen arbitration and its enforcement in the country. The Conference will have 7 intensive brainstorming technical sessions. These will dwell on different facets to strengthen institutional arbitration and ensure a facilitative judiciary to encourage Indian and foreign parties to arbitrate in India. More than 1000 experts and Government functionaries are expected to participate in the Conference besides 1200 students and faculty from various law colleges. The Conference comes in the backdrop of the immense losses suffered by the business enterprises and the economy at large, due to enormous backlogs involved in dispute resolution in Indian courts. This keep resources and money of the businesses trapped till resolution of the dispute. This is a major disincentive for foreign companies coming to invest in India. So they seek alternatives. One such alternative is arbitration which can be cost effective and quick. Increasingly, foreign companies that partner with Indian businesses are approaching countries outside of India for dispute resolution. In the World Bank Report on the Ease of Doing Business India has improved its position by 12 ranks. However, on the Enforcement of Contracts India fares extremely poorly and ranks 178 out of 189 countries. The World Bank Report suggests that improving the mechanism to resolve commercial disputes in India will go a long way in bettering India’s rank. Many Indian companies are going to foreign arbitration centres like Singapore, London and Paris taking a huge chunk of dispute resolution business outside India. Statistics make this picture clear. In 2012, 49 of the total 235 cases in Singapore International Arbitration Centre (SIAC) involved an Indian party. This figure grew to 85 out of 259 cases in 2013. India has already undertaken major structural reforms to facilitate ease of doing business recently, including legal reforms to revamp the existing arbitration framework. The Parliament has recently passed an Amendment to the Arbitration and Conciliation Act, 1996. Moreover, the Commercial Courts, Commercial Division and Commercial Appellate Division of High Courts Act, 2015 has been passed to fast track commercial dispute resolution. Building over these reforms, the initiative by Government and Judiciary will help to improve the institutional capacity necessary to create a vibrant ecosystem to make India the next big hub for international commercial arbitration.